Still time to book a spot on our Printmaking Workshop on Saturday with the very lovely & talented Jackie Curtis. I first saw work by Jackie Curtis at the lovely Ginger Fig Gallery in Taunton – and really liked it, especially the collagraphs and linocuts. I then went to Somerset Arts Week and met Jackie and saw lots of her work. I asked her if she would be interested in having an exhibition at Clavelshay Barn and she agreed to show some work in the restaurant. Our customers have loved her work and we have sold quite a few pieces. Jackie has been holding printing workshops at her home and I intended to go on one and then asked if she would consider holding one at Clavelshay Barn. The first workshop here will be on Saturday 9 March – cost £55 including lunch. Only a couple of spaces left so please book now – Tel 01278 662629. 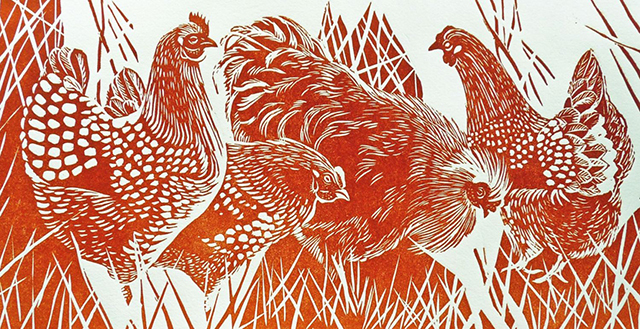 Come and spend the day with local artist and printmaker Jackie Curtis in the beautiful Somerset countryside, where she will provide expert one on one tuition and all the basic materials, and help you turn your ideas into print. Discover how to create contemporary, vibrant, textured prints that combine printmaking techniques specifically mono printing using a variety of materials manmade and natural; e.g. leaves, wood, nets, lace, feathers, bubble wrap anything with texture. The workshop will provide you with skills in a variety of techniques ranging from hand printing techniques, press producing prints and ghost prints. You will also try printing with foil and drawing into ink to produce an image and then finish with some plant materials like honesty and hogweed. *Workshops are limited to only 6-8 participants to ensure everyone gets plenty of 1 on 1 tuition throughout the day. Call Sue on 01278 662629 to find out more and book your spot on this workshop.